Sony DSC-HX9V zoom test - video. One of the good features of the compact digital camera Sony DSC-HX9V is that you can use the huge 16x optical zoom while making a movie. The picture is stable while zooming in and out and the overall quality is very good. Of course that is thanks to the perfect optical stabilisation and Sony's Exmor R CMOS sensor. Here is the Sony DSC-HX9V review, including all the features and specs of this incredible camera as well as a full video review. And here is the full Sony Cyber-Shot DSC-HX10V review. 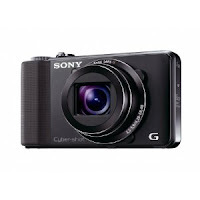 This is the upgraded new version and actually the successor of the Cyber-Shot DSC-HX9V. One of the differences is that the new model has 18.2 million effective pixels rather that 16.2 million in the DSC-HX9V. Sony Cyber-Shot DSC-HX10V also has better maximum light sensitivity at 12,800 ISO vs 3,200 ISO in the Cyber-Shot DSC-HX9V. The rest of the features and specs are pretty much the same, of course the DSC-HX10V is a bit more expensive as it is a newer model but many camera critics claim Cyber-Shot DSC-HX9V does the job just as well for a much lower price.